Behind-the-scenes in Fundamentals of Design (Art 131). Inside the classroom: Students explore 2-D and 3-D design in this introduction to the elements and principles used by visual arts. Learn about line, shape, value, color, texture, harmony, balance and contrast with this hands-on class that allows students to draw, paint and work on the computer to apply the design principles. By the end of the class, students have your own portfolio with a versatile collection of artistic works. The class brings out the artist in the student; no previous art experience is necessary. 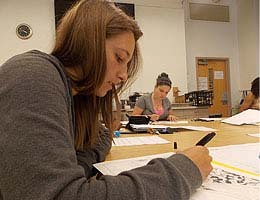 The class is a core requirement for students in all programs at the Visual Arts Center. Why this class sizzles: “It’s new territory to explore, and when we learn new territory, we stretch ourselves.” – Instructor Casey Scarborough, whose background is in fine arts. She has a passion for oil glaze painting.